It’s a busy time. First, this Monday, February 6th, I’m reading from a new short story, just finished, unpublished, not even under submission yet. 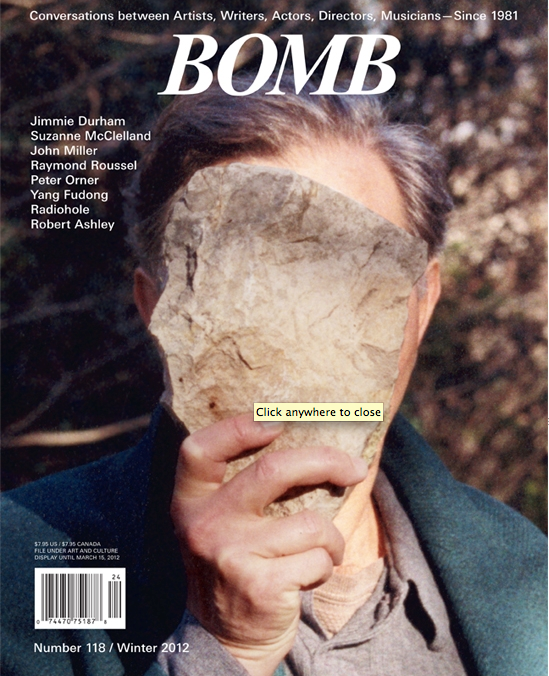 The occasion is the BOMB Magazine I ❤ BOMB party, at the Powerhouse Arena bookstore in DUMBO, Monday, February 6th. I’ll be reading with Myla Goldberg, Robin Elizabeth Schaer and Tina Chang. We’re celebrating Valentine’s Day but also sending off the BOMB Magazine party master/web master, the excellent Paul Morris, who is joining the staff at PEN, the organization for writers. I have a review of Daniel Clowes’ The Death Ray in the above winter issue, and as previously mentioned, an interview with Daniel at BOMB‘s site. 6 days after this, I will be speaking on a panel for Emily Books. February 12th to be precise. 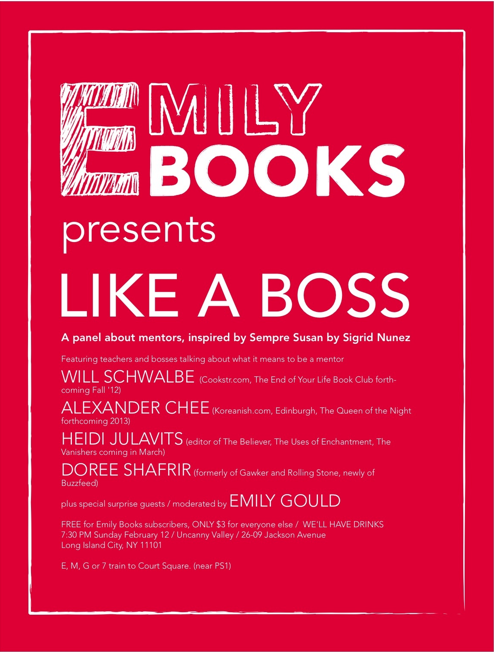 The Like a Boss panel is at the Uncanny Valley on Long Island City as a part of the Emily Book Club event for Sigrid Nunez’s brilliant memoir of Susan Sontag, Sempre Susan, the book club choice for February. I’ll appear with Heidi Julavits, Will Schwalbe and Doree Shafrir. Hope to see you at either or both. If you don’t know about Emily Books, by the way, it is an online independent bookstore and book club both, by subscription. Check it out. And, let me also announce that the paperback of the anthology Mentors, Muses and Monsters is out. If you haven’t read my memoir of studying with Annie Dillard, it’s in there, and also still here at the Morning News. Sigrid’s book about Sontag came from her essay for this anthology. I myself wrote an essay twice as large as the one that’s been published–we cut the second half, or what what I’d call the sequel to it, to make it fit for publication, for if I’d left it in, it would have been twice the size of the next largest essay. It’s not good to be that guy, but also, it seemed perhaps more esoteric. That section is about life after my study with Annie, when I struggled to make sense of what I’d learned, and put it all into practice. Reading Sigrid’s book has me thinking about it again, though. This may be something I’ll revise and send out later this year, or, it may be, well, not really interesting enough–it all takes place in my head, after all. And on the page. Anyway, I’ll have more news soon–a lot is happening this month. In the meantime, I hope to see you out at either of these events.